Deveau’s latest offering explores the interconnectedness of the lives and careers of three musical titans – Wagner, Liszt, and Brahms – juxtaposing Wagner and Liszt’s “music of the future” with the more traditional, established musical forms of Brahms. 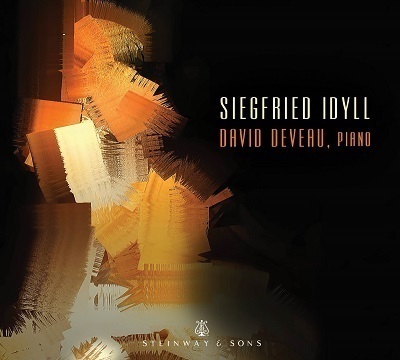 "On this recording, the pianist David Deveau gives a sensitive account of a fascinating solo piano transcription of Wagner’s “Siegfried Idyll,” originally written for chamber orchestra as a birthday gift for Cosima, Wagner’s wife. The arrangement is by Josef Rubinstein, a devoted assistant to Wagner. It’s a revelation to hear this sublime, intimate work played on the piano. The harmonic and contrapuntal intricacies come through with beautiful Read more transparency. The album also offers refined, accomplished performances of three Liszt works, including “Funérailles,” and a well-chosen selection of seven capriccios and intermezzos by Brahms." David Deveau's 2015 release on Steinway & Sons is an homage to three of the major figures of 19th century Romanticism, Franz Liszt, Johannes Brahms, and Richard Wagner. The piano was essential to Liszt and Brahms, and their works remain central in the modern repertoire, though Wagner's few contributions to piano music were minor. Even the title piece, Wagner's Siegfried Idyll, originally composed for a small chamber orchestra, appears here in a piano transcription by Josef Rubinstein, so its place on the program among keyboard works by Liszt and Brahms seems odd indeed. That said, Deveau's sympathy for all three composers is strong, and he makes this recital feel genuinely Romantic and passionate without indulging in the excesses of rubato and inaccurate dynamics typical of the style. While his playing allows for more playfulness and flexibility of tempo in Brahms' Capriccios and Intermezzos, he never veers into exaggerated gestures or sentimentality, and controls the rhapsodic impulse with introspection, most affectingly in the Intermezzo in E flat major, Op. 117, No. 1. "The two short Liszt pieces, Nuages gris and Am Grabe Richard Wagners, are very sensitively interpreted, the former work a rather overlooked masterpiece. It's especially haunting and ghostly sounding in this performance. The seven selections from Brahms' Opp. 76, 117, 118 and 119 are all masterful pieces and brilliantly played by Deveau. Steinway Classics has provided excellent sound reproduction in all selections, making this disc a most desirable acquisition for those with an interest in this repertory." Period: Romantic Written: 1845-1852 Weimar, Germany Date of Recording: 2014 Venue: Shalin Liu Center, Rockport, MA Length: 11 Minutes 24 Secs. Period: Romantic Written: 1870 Germany Date of Recording: 2014 Venue: Shalin Liu Center, Rockport, MA Length: 19 Minutes 31 Secs. Period: Romantic Written: 1878 Austria Date of Recording: 2014 Venue: Shalin Liu Center, Rockport, MA Length: 3 Minutes 41 Secs. Period: Romantic Written: 1878 Austria Date of Recording: 2014 Venue: Shalin Liu Center, Rockport, MA Length: 3 Minutes 45 Secs. Period: Romantic Written: 1892 Austria Date of Recording: 2014 Venue: Shalin Liu Center, Rockport, MA Length: 5 Minutes 6 Secs. Period: Romantic Written: 1892 Austria Date of Recording: 2014 Venue: Shalin Liu Center, Rockport, MA Length: 2 Minutes 8 Secs. Period: Romantic Written: 1892 Austria Date of Recording: 2014 Venue: Shalin Liu Center, Rockport, MA Length: 6 Minutes 15 Secs. Period: Romantic Written: 1892 Austria Date of Recording: 2014 Venue: Shalin Liu Center, Rockport, MA Length: 5 Minutes 32 Secs. Period: Romantic Written: 1892 Austria Date of Recording: 2014 Venue: Shalin Liu Center, Rockport, MA Length: 1 Minutes 45 Secs. Period: Romantic Written: 1881 Rome, Italy Date of Recording: 2014 Venue: Shalin Liu Center, Rockport, MA Length: 3 Minutes 4 Secs. Period: Romantic Written: 1883 Rome, Italy Date of Recording: 2014 Venue: Shalin Liu Center, Rockport, MA Length: 2 Minutes 52 Secs.